Image caption Sergej Aleksandrvicius was "effectively working a day shift selling drugs"
A man caught near a primary school had more than £5,500 of drugs and cash on him. Sergej Aleksandrvicius had 142 wraps of heroin and crack cocaine when he was stopped by police in Woodsghyll Drive, Carlisle, Harraby. The 19-year-old of Eccles, Salford, had been offered free cannabis to be a "county lines" dealer. Appearing at Carlisle Crown Court, he admitted possessing drugs with intent to supply and was jailed for 40 months. The hearing was told that Aleksandrvicius had attempted to get away from police who wrestled him to the ground. 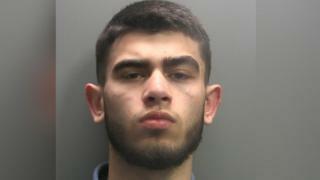 Aleksandrvicius, of Verdun Road in Eccles, was found to have £2,000 of cash and £3,500 of drugs on him. Judge Andrew Jefferies QC said: "You were effectively working a day shift selling drugs in this local area. "This is a county lines case of dealing." "County lines" is a tactic whereby gangs in places such as London, Liverpool and Birmingham introduce untraceable phones to a different area to sell drugs at street level. Local runners - often teenagers - are used to transport the drugs.